Price is per two of these large focal beads. As they are natural, patterns will be different to picture. Size of each is a huge 50mm x 19mm - heavy! Ideal for a pendant or the center-piece on a necklace. No gemstone is more creatively striped by nature than agate, chalecedony quartz that forms in concentric layers in a wide variety of colors and textures. Each individual agate forms by filling a cavity in host rock. 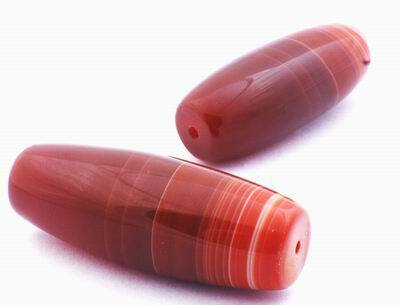 As a result, agate often is found as a round nodule, with concentric bands like the rings of a tree trunk. The bands sometimes look like eyes, sometimes fanciful scallops, or even a landscape with dendrite trees. Agate was highly valued as a talisman or amulet in ancient times. It was said to quench thirst and protect from fevers. Persian magicians used agate to divert storms. A famous collection of two to four thousand agate bowls which was accumulated by Mithradates, king of Pontus, shows the enthusiasm with which agate was regarded. Agate bowls were also popular in the Byzantine Empire. Collecting agate bowls became common among European royalty during the Renaissance and many museums in Europe, including the Louvre, have spectacular examples.